The Hatton Garden diamond heist is generally considered to be one of the biggest in British history. It has never been properly calculated how much was stolen in the form of diamonds, gold and cash, but estimates go as high as £200 Million. This film is based on the incredible true story of the people who did it, how they did it and how they got caught. Brian is an old man who is renowned through London as an excellent thief, along with Terry, John, Carl and Danny are convinced by new boy Basil to take on a job to steal everything from the deposit boxes in Hatton Garden Safe Deposit. This will consist of money, gold, diamonds and more. The plan is put into place and despite their advanced ages up to seventy apart from young Basil, they pull off the job. However, greed and distrust between the gang results in them turning on each other and the investigation to catch who did it soon closes in. I must say this was one of the best British films I have seen all year. When I looked at the cast I just smiled and thought 'There is no way that this is going to be bad'. I'm glad to say that my faith was rewarded and this film is excellent. This could have been just another excuse for Michael Caine to shout and Ray Winstone to punch walls, but it is a clever, well written and beautifully acted film. Every member of the cast is perfect and it is surprising seeing such a wonderful ensemble of character actors and there is a warmth to everything. This was one of the few films in recent years, which I have recommended to others after seeing in the cinema. Usually, I would recommend the odd film or tell them to wait until it’s available to watch at home, but this film was so good I had to recommend it to everyone. It is a shame that it has flown under the radar during award season as I felt the direction of James Marsh (who won an Oscar for Man on Wire) was excellent and Joe Penhall’s screenplay should have been recognised for just how tight and cleverly written it is. It is a shame that there is no commentary with this film as in the interviews everyone seemed interested and wanted to talk about the making. There is a quick featurette about the making of the film which is a mix of interviews with everyone involved. Bringing The Ensemble together is a very quick look at the actors and how they got on. It would have been nice to have seen more of this, but it is still a nice quick overview of it. Michael Caine interview is a seven minute interview with him about the film and the real people and incident. This is interesting, but it would have been nice to have heard from the rest of the cast and Production team. Deleted scenes consisted if two scenes, one with the Michael Gambon and Tom Courtney characters having some kind of massage (it needs to be seen to be believed) and one with the Michael Caine character confronting Jim Broadbent. I'm not sure why they deleted the second scene as it brought a great deal of menace to the characters, but it probably due to time or pacing. Finally there is a Trailer which does its job. 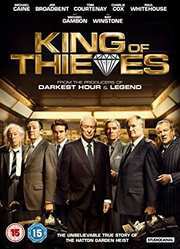 King of Thieves is a great film in vein of things like the original The Italian Job and other classic British Gangster films. I found there was a good mix of drama and comedy and this was an ensemble cast to die for. It is definitely a film I would recommend and it would a be a diamond of anyone’s collection.